At Orcanos, we ensure your products are produced under Good Manufacturing Practice (GMP) in adherence to regulatory guidelines and standards. 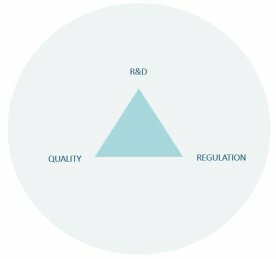 We provide the entire quality management system and ensure that your products meet and surpass regulatory compliance standards such as ISO 13485, 21 CFR Part 11, ISO 14971, and more. Orcanos is the only software that integrates your design control, quality management and regulatory compliance in a single integrated system. This integrated system is designed to cater to your company’s production process while managing the design and control of your processes. Our system for ensuring a consistent and standardized quality of products has been revamped in our Orcanos Medical 4.1 release, making it the best choice for GMP Compliance System. The basic GMP regulations require that the manufacturer maintains adequate records and documentation to give a detailed picture of the manufacturing process, provide a basis for planning future manufacturing processes and enhance the quality assurance and auditing processes. The documents to be maintained include: quality manual, policies, standard operating procedures, batch records of procedures for production-related tasks and activities, test methods, specifications and logbooks for operation maintenance, control changes and calibration of equipment etc. Our GMP compliance software is a cloud-based documentation software designed to design, organize and control documents and workflow in any manufacturing process. It enables the user to create, archive, generate, review and audit all documentation related to the design, development, and manufacturing of a product. The DMS Audit trail keeps a log of each change when each update was made and by whom, and the electronic signature process that enable users to sign documents irrespective of their location (Satisfying 21 CFR Part 11). The PDF Publishing utility publishes each file to PDF once it is approved. This makes management of documents easy and safe. Our change control management software enables organizations to create a proper workflow to control changes made. Based on regulatory requirements, manufacturing companies are to establish details of changes made in assurance of product quality and safety. This eases traceability if issues arise later on. The change form contains details of the information needed throughout the change process. Our GMP compliance software eradicates paper-based change control processes. Orcanos QMS software supports planning and tracking of changes. The resulting step changes are then implemented in the product. The Orcanos Change Control Management system includes the following capabilities: Secured electronic, and centralized web-based system; Tractability to other quality processes, such as CAPA, FMEA, Complaints, CAPA, etc; Prioritization; Smart dashboards; Workflow and e-sign automation etc. Constant assessment of the potential risk in your manufacturing process and its effects on customers, processes, and workers is crucial to maintaining a seamless manufacturing process that produces products of standard quality. Regulatory bodies require a risk assessment of the potential effects of products with substandard quality. This risk assessment includes the potential risks to consumers after using substandard products. Our GMP compliance software identifies the long term risks by simulating and analyzing different possible occurrences and re-occurrences of issues. Once risk is identified, Orcanos supports the entire process of risk estimation, through risk control and control verification in one integrated system, using the traceability matrix. The Orcanos 4.0 release now includes a complete training program plan to support the GMP process. The training contains a list of topics and agenda to be covered in compliance with the GMP. The training covers topics in various areas, such as: quality assurance, validation, regulatory affairs, microbiology, GMP in Pharmaceutical Development, quality control, data integrity, sterile/antiseptic manufacturing etc. Orcanos Corrective Action and Preventive Action Management system (CAPA) ensures compliance to regulations standards and adherence to the guidelines. It reduces audit time, reduces the risk of product recall and improves product quality. Our CAPA system is integrated with other regulatory processes such as change control and risk management. By automating the management process of routing, delivery and notification of corrective and preventive actions and its related documents from initiation through investigation to closure, a centralized web-based system is provided for all the CAPA documents. The Orcanos CAPA system includes the following capabilities: Secured electronic, and centralized web-based system; Tractability to other quality processes, such as Change Control, FMEA, Training, ECO, Verification,Complaints, etc; Corrective and Preventive Action Management; Root-cause and action planning; Prioritization; Verification of Effectiveness; Smart dashboards; Workflow and e-sign automation etc. When your product fails to comply with regulatory requirements and specifications, deviations arise in terms of the product quality. When a deviation occurs, it is expedient that it is resolved as fast as possible. Orcanos GMP nonconformance management software enables to record and track nonconformance from the moment they are identified, to the resolution. With our GMP nonconformance software, all laboratory controls contain the established regulatory specifications and standards and the test procedures are designed to assure that product components conform to regulatory standards. Orcanos GMP compliance Software allows to evaluate deviations and assess the risks, guide your team through the resolution process and continually improve on your process. The Orcanos Nonconformance system includes the following capabilities: Secured electronic, and centralized web-based system; Tractability to other quality processes, such as Change Control, FMEA, Verification, Complaints, CAPA, etc; Root-cause and action planning; Prioritization; Smart dashboards; Workflow and e-sign automation etc. The Electronic Device History Record (DHR) System enables organizations to collect all the information required by the FDA’s Quality System Regulation which is to document all the production of each batch of a product. By utilizing this record system, you are able to reduce risks, automate processes, improve decision making and trace faulty products to their batches. The Orcanos e-DHR system includes the following capabilities: Secured electronic, and centralized web-based system; Tractability to other quality processes, such as Change Control, FMEA, Verification, Complaints, CAPA, etc; Verification and validation, and QA reports; Smart dashboards; Workflow and e-sign automation etc. Orcanos Audit Management System allows preparing and managing audits electronically. Conducting periodic audits based on your industry is crucial in order to comply with regulations and to ensure product safety and quality. Each audit can have an audit checklist to specify the topics under audit, and then link to audit findings based on the findings. The Orcanos Electronic Audit Management System includes the following capabilities: Secured electronic, and centralized web-based system; Tractability to other quality processes, such as Nonconformance, FMEA, Training, Verification, Complaints, CAPA, etc; Smart dashboards; Workflow and e-sign automation etc. Standardization of documented processes and automation of the flow, review, escalation, and approval of documents making search and retrieval of documents easier. Lowers your risk: By using our GMP compliance software, you reduce the risks associated with poor quality of your products through our change control integration and Electronic Device History Record (DHR ) System amongst other features.